December 20, 2012 All street paving and striping is complete, with the exception of the new cul-de-sac at the end of Lakeshore Ave. The culvert that restricted tidal flows in and out of the Lake for over a century has been demolished, and a 100 foot wide channel is now wide open beneath the new bridge. The new tidal marsh has been graded and pickleweed has been planted. The restroom is nearly complete, with stainless steel mesh installation underway and exterior painting coming next. Adjustments are being made to the pedestrian bridge prior to pouring the concrete deck. Grading and paving of park pathways continues, as well as irrigation and landscaping. Excess soil stockpiles will continue to be offhauled, and the parking lot reconfiguration by the H.J. Kaiser Convention Center also continues. 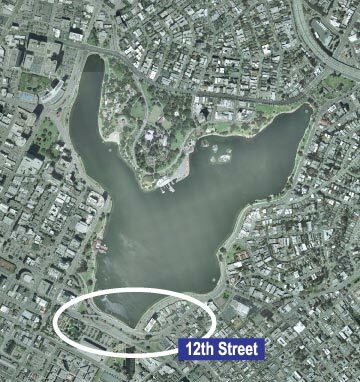 PG&E has yet to provide permanent power to much of the site, and EBMUD has yet to install a water meter for the Lakeshore Drive area. Rainy weather and wet ground has slowed the work, and completion has been pushed into early 2013.